I was pleased to see how much coverage the paper on the health reform vote I did with Brendan Nyhan, Eric McGhee, John Sides, and Steve Greene received last week. While I see this as an encouraging sign for both academia and political journalism (and blogging! ), it also serves as a reminder of the different perspectives and professional goals of academics and reporters. Basically, we analyzed the impact of a two-year old roll call vote on an election that occurred a year and a half ago. While that may be interesting scholarship to some, it's not really "news," in the sense that it's not, well, new. What is potentially newsworthy is the idea that the effect we reported in the paper -- voters turning against House Democrats for supporting health care reform -- could still be in play for 2012, possibly costing Democrats the Senate and the White House. One reason ACA might not have much of an effect in Congressional elections this year is that all the vulnerable Democrats were kicked out in 2010. The ACA supporters who remain have relatively safe districts. It may be that a few senators who were not up in 2010 could still pay a price (this may be part of Ben Nelson's reason for retiring), but that's much harder to say. [The authors] conclude that Democrats’ support for Obama-care led voters “to perceive them as more liberal,” “more ideologically distant,” and “out of step.” This was particularly true for independent voters. In other words, voters not only oppose Obamacare as policy but view it as a symbol of a commitment to big-government liberalism. This strongly suggests that the more Obama-care becomes an issue in the fall, the more it will highlight President Obama’s liberalism in the minds of voters—particularly independent voters. It correspondingly suggests that the more this election is focused simply on stewardship of the economy, the less Obama’s big-government liberalism will be highlighted in voters’ minds. A few things here. First, the electorate of 2010 will look rather different from the electorate of 2012. To say that our study shows that "voters... oppose Obamacare as policy," as Anderson and Kristol do, is to elide some pretty important differences between the two elections. Second, we really don't know (and our study didn't say) what kind of effect health care reform would have on President Obama. Voters go into a congressional election typically not knowing a great deal about the congressional candidates. A highly salient roll call vote on health care reform could provide a convenient (and not terribly inaccurate) information shortcut for such voters, helping them fill in the blanks in their assessment of the incumbent. But does the health reform vote provide any new information about Barack Obama, whom is already pretty well known by the 2012 electorate? He ran for president in support of this legislation four years ago and championed it throughout 2009 and 2010. What does his support of health care reform tell you that you didn't already know about him? Democratic support for Obamacare cost House Democrats their majority in 2010 and could whack Senate Democratic backers of the president’s health care plan this year, according to a new analysis provided to Washington Secrets. With the Supreme Court and both parties gearing up for another bruising fight this year over Obamacare, the issue is likely to crash into the fall elections. 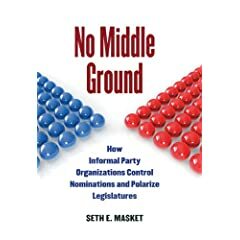 Masket said that could undermine Democratic efforts to keep control of the Senate, since far more Democratic senators who voted for health care reform are up for reelection this year than in 2010. That may be true about more ACA supporters being up for reelection this year, but I don't recall saying it or even thinking it. I can't find any claim to this effect in our paper or in our later write-ups. As far as I can tell, Bedard's "Masket said..." statement is pure fiction. News reporting of academic research is inevitably tricky. Hedged conjecture becomes certain prediction. Statistical controls are often ignored. Discussion is often projected outside the data that produced the original findings. Key concepts about statistical significance are often missed. But it would be nice if columnists and reporters could acknowledge some of the uncertainty inherent in such research, or at least refrain from making stuff up. Update: Yesterday was a ski day for me, so I'd missed that Jonathan Bernstein made many of the same points about presidential elections. My bad. The phenomena you mention is a regular favorite at PhD Comics.